Featured in our Spring 2019 programme. Browse the full season here. Take advantage of our double-bill ticket offer, and book two different shows on the same night for just £16, or make the most of our Season Pass and book tickets for three different shows to receive a 10% discount. Simply add the tickets for the shows into your basket and we’ll do the rest. All you need is a camera, an internet connection and something to say. Last year, 34% of young people voted YouTuber as their top career choice. Claire was intrigued. She decided to have a go. Part documentary, part live performance, part parody, part desperate as f*ck, Claire does everything she can to entertain her online audience. While remaining 100% totally authentically real. Examining validation, confession and the cost of sharing, See-Through is an edited, unedited, live, pre-recorded, reality show that invites you to see behind the camera. Developed with support from Arts Council England, Lincoln Performing Arts Centre, Derby Theatre, Camden People’s Theatre and The Old Church. 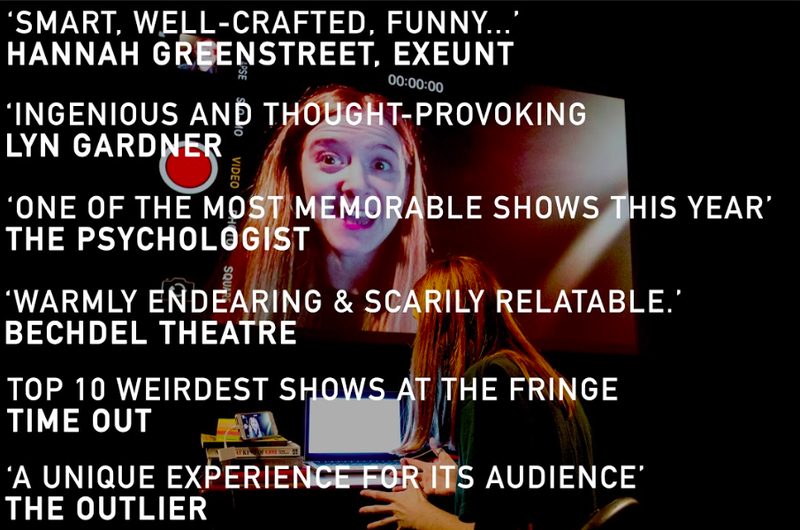 Claire is a theatre-maker and performer creating work in the East Midlands and London. Described as ‘a talent to keep an eye on’ (Gareth Vile, LIST), she specialises in creating research-driven, multi-disciplinary solo performance blending live art, storytelling and multimedia. Claire is Associate Artist at The Old Church in Hackney and one of CPT’s 2019 starting blocks artists.